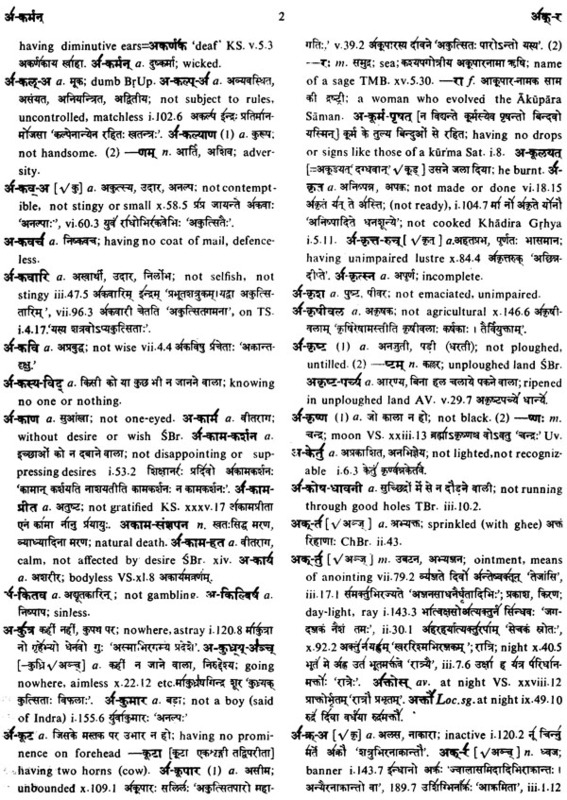 Almost all the words in the four Vedas have been defined in Hindi and English in this new dictionary. The entries have been illustrated with examples to make their meanings clear, and many words not found in earlier dictionaries are included in this work. In several instances fresh and more accurate meanings (and etymologies) have been provided where those in the traditional and other modern dictionaries seemed misleading. 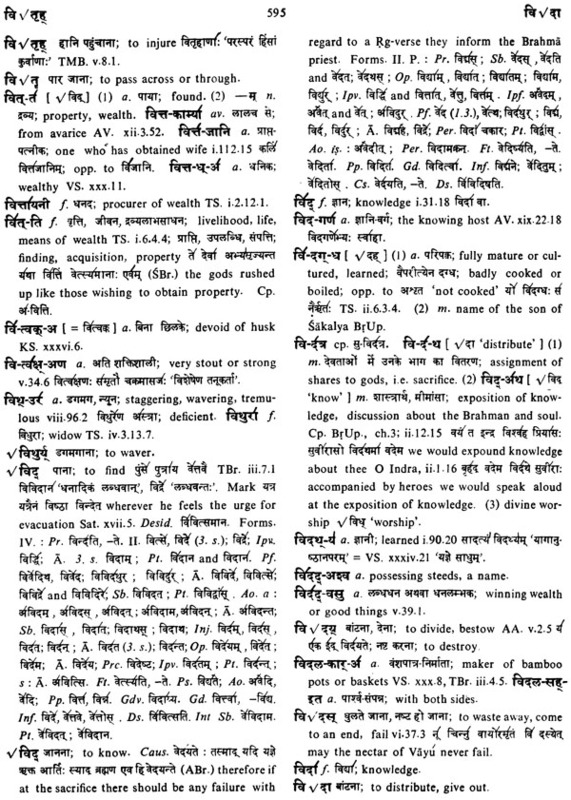 The work incorporates the results of the latest researches in the field and includes, besides many others, all the words treated in MacDonnell’s great Vedic Grammar (1909). 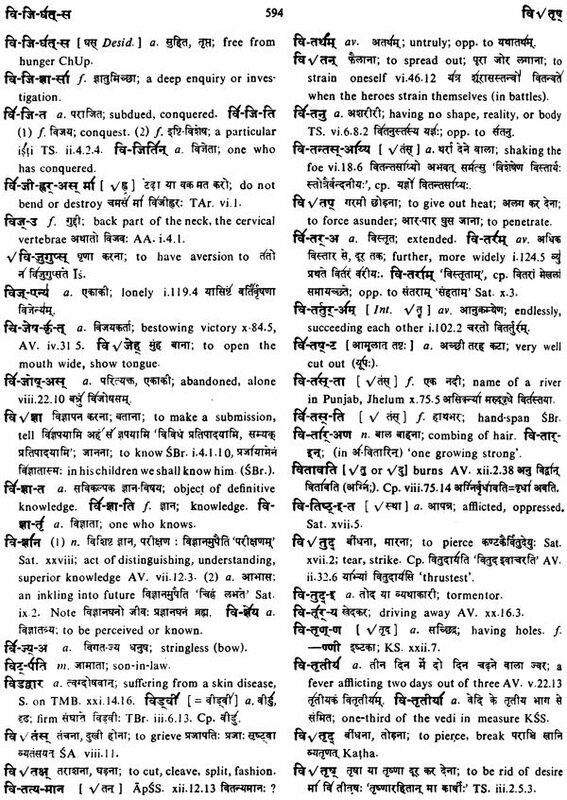 This Dictionary is the first comprehensive Vedic dictionary, for earlier works cover either the Rgveda alone or the whole of Sanskrit literature-in either case they do not adequately meet the needs of the Vedic student. 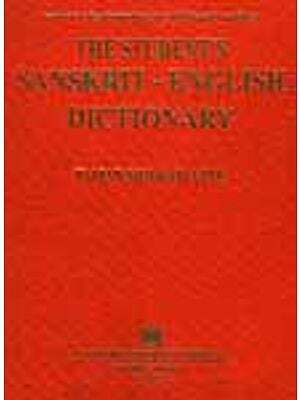 Dr Suryakanta is a celebrated Sanskrit scholar and teacher and the author of several major books in the field, including a Sanskrit-Hindi- English Dictionary (1975). Educated in Lahore and Oxford, he taught in the University of Punjab, Lahore, before 1947. Thereafter, he has been a member of the Legislative Council of Punjab (India), Professor and Head of the Department of Sanskrit and Pali at Banaras Hindu University and Professor at Aligarh Muslim University. In 1966 he moved to Kurukshetra University and taught there until 1969. The word Veda, primarily meaning 'knowledge', signifies the 'sacred lore' treasured in the four poetical collections (called the Vedas for this very reason) and the ancillary literature comprising explanations of Vedic verses, philosophical speculations and legends. 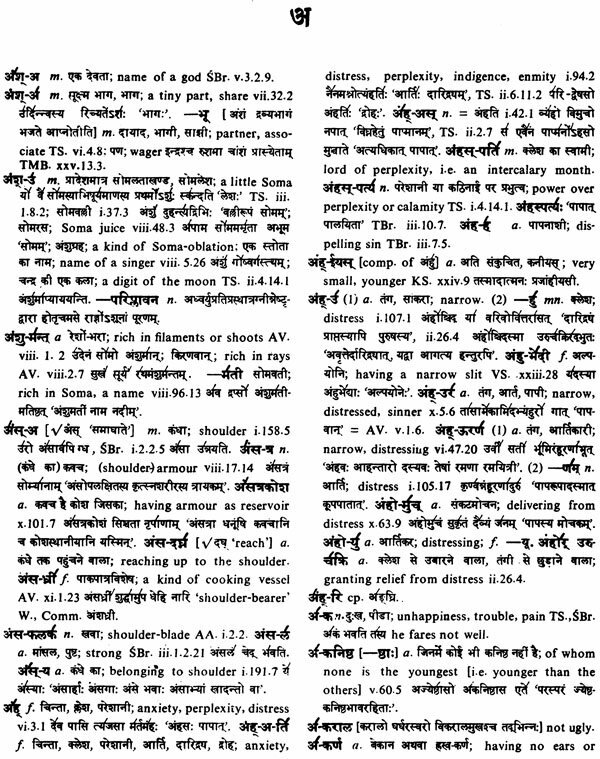 The four chief Samhitas or collections were named according to the uses their verses were put to: the Rgveda, the book of prayers or laudatory verses; the Yajurveda, the book of sacrificial formulae, divided into the Black and the White; the Sarnaveda, the book of chants; and the Atharvaveda, the book of magical spells and philosophical speculations. After the Vedas come their explanations, the Brahmanas, Aranyakas, Upanisads and a variety of sutras, split up into Srauta, Grhya and Dharma. By far the most important as well as the oldest - for it is the very foundation of the entire Vedic literature - is the Rgveda. The number of hymns in the Rgveda is 1,017, or 1,028 if the eleven supplementary hymns, called Valakhilyas - which are inserted in the middle of the Eighth Book - are added. All these hymns are grouped in the various books, called mandalas, which vary in length, except that the tenth contains the same number of hymns as the first, i.e., 191. 1. 0 Agni, thou art the mighty lndra of the devout; thou the wide-striding Visnu. 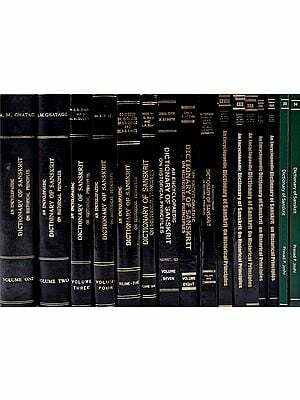 Thou, 0 Brahrmnaspati (art) Brahman, the wealth-finder; thou, O Sustainer, tendest (us) with wisdom. 2. Thou art King Varuna, 0 Agni, the upholder of law; thou art Mitra, the wondrous, adorable. Thou art Aryaman, the lord of the pious, bestowing agreeable gifts. Thou art Amsa, 0 god, the distributor. 3. Thou art Tvastar, 0 Agni, (imparting) heroism to the worshipper; the divine women enjoy thy kinship, 0 wielder of Mitra's power. Thou of swift impulse bestowest wealth, rich in high-bred horses. Thou of abundant riches, constitutest the might of men. 4. Thou art, 0 Agni, Rudra, the gift-giver of the mighty heaven; thou art the zeal of the Maruts; thou rulest over food. Thou rushest along the ruddy winds (as harbinger of) weal to the dwellings. As Pusan, thou protectest the pious. 5. Bestower of riches on the worshipper art thou; thou art the divine Savitar, giver of wealth. As Bhaga thou rulest over wealth; thou protectest him at home who renders worship to thee. 6. Rbhu art thou, 0 Agni, to be closely adored; thou rulest over food-laden booty and wealth. Thou shinest wide and burnest bright for the patron; a competent guide art thou, perpetually extending sacrifice. 7. Thou, 0 god Agni, art Aditi to him who offers oblations; thou, as Hotra Bharati waxest strong with song. Thou art the hundred-wintered Ila for competence. Thou art, 0 god of riches, the slayer of Vrtra. Thou art Sarasvati. What constitutes Agni, the supreme Vedic god, the one god into whom all the gods coalesce so willingly? It was his indwelling immanence, his all-pervasiveness, signified by the felicitous epithet Si-rd, the quality of illumination, his power of imparting life to all things that are epitomized in the word Agni, 'the self-revealing one'. Agni, as such, is a synonym for the life-principle, the elan vital that vibrates the entire universe. 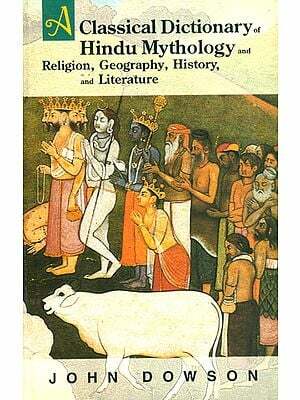 The Rgveda sings of him and the Satapatha discusses Agni in detail time and again (cf. XI.4.6.4). The life-giving properties of Agni are signalized by the two words osa-dhi and atas-a, both meaning 'plant'. Osa means fire, while alas may be a cognate of the Persian atis, meaning 'fire'. It is hardly necessary to add that in ancient medical systems the plant symbolizes healing and life, a fact made clear by 'thou art born in the sparkling womb of the plants' (R Y. II .1.14). The Vedic sage comes again and again to Agni with awe and questioning wonder and is repeatedly told that Agni imparts life to him and activates the entire universe. To track this source of life to its home, to capture it and to wrest from it its magical secrets has been the major ambition of the Vedic sages. The Rgveda employs ever-new imagery to lay bare the immanence, omnipotence and all-sustaining power of Agni. Agni is Si-ra, lies behind every atom, radiating it; Agni is the indwelling life and energy at work in the depths of every personality; in fact the existence of all things derives from Agni's glory. RY. 1.66-67present this kaleidoscope of quickly changing pictures, with the poet manipulating the marionettes he employs to reveal the countless facets of Agni, the all-refulgent god. Agni is indeed seen in the Rgveda from all angles 'like a dome of many-coloured glass'. The Veda beckons the devotee to behold this spectacle and learn from it the undying iesson of self-sacrifice for the redemption of himself and for the advancement of society. It moves him again and again, with a push as it were, towards the Primal Loom at which Purusa is busy weaving •the countless patterns of eternal life. The pattern of life and society that evolves from the pursuit of such an ideal was inspiring and creative. Vedic life was one of ceaseless sacrifice, culminating in the Sarva-Vedasa, that demands surrender of one's entire property, even life itself. So potent indeed is the appeal of the horse to Vedic man and so passionate the devotion it arouses in him that there is almost no sphere of his intellectual, spiritual or physical activity which has not been deeply touched by this animal. In course of time the horse became a symbol of Vedic culture, so that the moment a Vedic sage sees an orb of sparkling glory he at once recollects his horse. Take for example the die, dangling on the gaming table; it is enough to induce the Vedic sage to sing of the hypnotic power of the die, as a brown horse: 'since he yokes the brown horses (dies) in the morning, he falls down in the evening near the fire, a beggar' (RV. X.34.11). This identification of the horse with the die may seem a little far-fetched; but it is explicit in this context; indeed the horse is identified with other objects too that bear no physical resemblance to it except that they vibrate and vibrate with force. Nothing can be more instructive in this regard than the identification of the horse with the Soma-drop; and one is struck by the felicity with which this is done in the ninth mandala of the Rgveda, which is exclusively devoted to singing of the glory of Soma. While the glistening Soma-drop earns the sobriquet vajin (the stallion stalwart), the expression occurring one hundred and seventeen times in the ninth mandala of the Rgveda (RV. IX.80.3), the stones that grind the Soma plant are called gravan, i.e., the singers of the beauty and courage and speed of the horse (the word gravan being derived from the root gr meaning 'to sing').